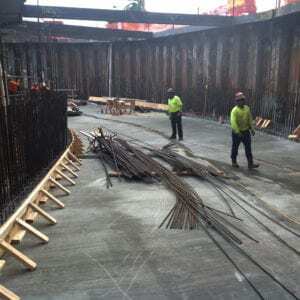 Griffin provides Dewatering Services for a $1.5B Hotel and Casino located in Hollywood, Florida, where groundwater is 5-7 feet (ft.) below ground surface. The project required lowering groundwater levels as much as 15 ft. to depths of greater than 20 ft. below grade, at multiple structures concurrently, without impacting access or construction methodology. The entire site had sandy soil approximately 45 ft. deep underlain by limestone that contributed in varying degrees to groundwater flows. Water levels fluctuated seasonally around 5-7 ft. below ground surface. Some of the construction occurred during hurricane season and was impacted by Hurricane Irma, the 5th costliest hurricane to hit the mainland U.S.
Griffin assisted with the dewatering of 6 structures across the project site. The dewatering effort included over 2,000 LF of wellpoint systems and 28 deep wells pumping approximately 5,000 GPM. The application of our knowledge in deep well construction and aquifer modeling is unique and provided Griffin the ability to use an alternate to the wellpoints typically utilized in South Florida. During installation of the East Tower and Valet Tunnel, our experts used pump test data to model the anticipated impact of the dewatering system. This data was used to modify the number of wells, spacing, and layout to ensure that we would accomplish the desired drawdown. During the project the entire site had to shut down as Hurricane Irma made landfall in South Florida. Griffin worked with the trades on-site to safely flood all excavations (to prevent damage to buoyant foundations) during dewatering system shutdown. Griffin was also among the first trades back on-site working to unwater all excavations and restart the dewatering systems to minimize the impact to the construction schedule. Griffin provided dedicated operations and maintenance personnel to keep the multiple systems operational during the complex construction sequence. Griffin coordinated with the prime contractor and other trades on-site to modify, relocate, and adjust equipment layouts to allow construction to progress without interruption.